The Western Balkans are "showing evident signs of State capture, covering links with organised crime and corruption at all levels of government and administration, as well as a major overlapping of public and private interests." It was in these blunt terms that the European Commission analysed the "rule of Law" in the region in its communication on 6th February 2018, in which it recalled the conditions for these countries' accession and how the Union should help them and prepare itself by undertaking reform. A further communication on 17th April presented detailed per country reports, which, confirming the previous study, did nothing to brighten the outlook. The Commission did however indicate that Montenegro and Serbia "might be ready to join by 2025" and on 17th April it recommended the opening of membership negotiations with Albania and Macedonia. It also proposed "six flagship re-commitment initiatives" by the Union to ensure the stability of the Balkans better and to prepare for their integration, confirmed at the Sofia Summit on 17th May 2018. The Council of 26th June approved the Commission's analysis, approved the reforms to be undertaken and provided its support to the six Sofia Programme initiatives. It renewed its "commitment for enlargement, which remains a key Union policy, and its resolute support for the European perspective of the Western Balkans." However, on the insistence of France and the Netherlands, it postponed the opening of membership negotiations with Albania and Macedonia until June 2019, on reserve of continued reform. The European Council of 28th and 29th June "endorsed the conclusions on enlargement and the stabilisation and association process adopted by the Council." The analysis made by the Commission on the political chapter - to which the Council fully subscribed - is unequivocal: the rule of Law must be significantly strengthened, the judiciary has to become independent and professional, the freedom of the media fully guaranteed and fundamental rights respected in deed, notably those of the Roma minority. It is also time for governments and their administrations to take full responsibility for their acts. To do this the reform of the latter must be stepped up and democratic institutions, starting with the parliaments, must play their natural role of executive and counterweight. The emphasis is evidently placed on the fight to counter corruption and the dismantling of criminal networks. The detailed analysis in the per country reports confirms that none of these countries escape these general points of criticism. Milo Djukanovic, who became president once more after the election on 15th April 2018, can claim to have brought Montenegro stability, sound economic development and NATO membership, despite strong domestic, Russian-backed opposition. But he can only use this pro-Western pivot as capital if it goes hand in hand with real reform. But the Commission notes that these are not really forthcoming in the field: "tangible results must be shown". We might also wonder at the fight to counter corruption in this country where the office of special prosecutor has been created, but where 300 cases were abandoned in 2016 and 80 in 2017 : reform on paper; to fulfil one condition without consequence; or real reform the impact of which is still a long way off? Moreover, accustomed to unexplained attacks against the press, the country witnessed the murder of one of its journalists, Olivera Lakic, in front of her home in Podgorica on 8th May 2018. The freedom of the media will haunt membership negotiations. After 25 years in office will the Prime Minister be able to start vital in-depth reform? Also, six years after the start of membership negotiations on 29th June 2012, only three chapters out of 31 initiated have be closed. And the Association Council of 25th June 2018 again pointed to the lack of any real results in the fight to counter corruption, organised crime and in support of the freedom of the media, which was also highlighted at the Council on 26th June. Serbia also remains a State in which the freedom of the media is limited, out of self-censorship as much as out of pressure by the authorities. Again, there has been little effect in the field by the reforms that have been started. Although parliament does not play its role, the Ombudsman and the Court of Auditors show that the country's institutional system is well established. But the rule of law and governance do not follow this trend, since the coalition in office tries to control the system, the sources of financing and impedes everything that might reduce its political grip. Sasa Radulovic pointed to this in 2014 already - with the latter having to relinquish the Ministry of the Economy for these reasons after just five months. Four years after the start of membership negotiations on 21st January 2014, 14 chapters have been opened and 2 closed. The European Union may have lent more importance to dialogue with Kosovo than to fundamental reform, to the disappointment of a share of civil society, which is concerned that the quest for stability will win over the defence of democracy. The Council stressed that Serbia should produce some tangible results regarding the rule of Law, the fight to counter corruption and organised crime, and it laid strong emphasis on the freedom of the media and the lack of parliamentary control over the executive. Albania is being encouraged to continue its reform of the judicial system, notably via the now ongoing magistrates' vetting process, which is indeed leading to tangible results. This brave, yet risky reform has helped towards the Commission's recommendation to open membership negotiations. The opposition did not approve a resolution however in the Assembly in this direction, whilst ten years earlier a similar vote was the focus of unanimity. And this confirms the country's political polarisation and the intriguing obstinacy of opposition leader Lulzim Basha. The importance of the criminal networks and the great number of asylum seekers (330,000 Albanians left the country between 2011 and 2017, whilst only 6% achieved refugee status) continues to affect Albania/EU relations. This explains why the Council, whilst appreciating the on-going reforms, decided to delay the opening of membership negotiations, until June 2019, on reserve that reforms continue. Przino Agreement that brought an end to the internal political conflict between the two main Slav parties in Macedonia and brought to office the Social Democratic Party of Zoran Zaev, with his Albanian allies of the DUI, revived reform, whilst appeasing tension that former Prime Minister Nikola Gruevski had exacerbated, and that Russia very skillfully exploited. Moreover, Macedonia signed a courageous friendship and partnership treaty with Bulgaria. This is what the Commission welcomed as it recommended the launch of membership negotiations. A recommendation which has taken on its full meaning since the historic agreement concluded between the Prime Ministers Zoran Zaev and Alexis Tsipras on 12th June 2018 - and signed on 17th - over the name of "Republic of North Macedonia". After 27 years in this "identity dispute", this is an excellent step forward for regional stability, opening the way to membership negotiations with the EU and the doors to NATO. Despite the opposition of the VMRO and that of the Greek nationalists, who claim loudly that this is "betrayal", the agreement was ratified by the Macedonian parliament and the Greek opposition failed in its motion of no-confidence. It still has to be ratified by Athens and accepted by referendum in Macedonia with the revision of the Constitution. Whilst lauding this progress - exemplary as are all the difficult reforms and compromises in the Balkans - the Council delayed the opening of membership negotiations until June 2019, on the insistence of France and also on reserve of the continuation of reform. "Deep seated structural problems are impeding the country's development," was the way the Commission summarised Bosnia-Herzegovina's stagnation. The hope placed in the acceptance of its candidature has failed. The paradox is that the Bosno-Croatian Federation is facing a great number of internal conflicts, whilst the Republika Srpska has distinguished itself by its transposal of the acquis communautaire. This simply confirms the Federation's lack of responsibility and the need for deep institutional reform. "Unite if you want to join the Union", was the message sent by President Juncker on his trip to Sarajevo in February 2018. The Council repeated that it wanted the government's programme of reform, agreed upon with the Union, to be fully implemented. "Your country is governed by a culture of impunity. The Commission's strategy is shaped according to how you have built your State capture, with organised crime and corruption at all levels." This is how political expert Veton Suroi interprets the Commission's analysis as he publishes a fictitious letter from Jean-Claude Juncker to the Prime Minister of Kosovo, Ramush Haradinai, who deemed that his country was not being treaty in the same way as the others. How could he whilst his 100-member government has just given the green light for the appointment of coordinators paid a minister's salary (for a population of 1.8 million inhabitants), doubling his own salary and with the country facing an economic and financial crisis and a 42% unemployment rate in this, the poorest State in the Balkans? How can the Union commit any further whilst it is under the control of the oligarchs, clientelism and exacerbated clannism. One opposition voice, Pantina Shqipe, brings reason back to the discussion: "Kosovo is so far from the Union that before blaming it, it should do some self-assessment". The citizens' disappointment since independence - and that of the countries which are "friends" of Kosovo - is on a par with the private monopolisation of public resources and political conflict of another age into which the country is sinking, and which even the American protector has difficulty to prevent. The Council re-iterated its expectations of the full implementation of the Stabilisation and Association Agreement and for a resolute policy against corruption and organised crime. Given these persistent weaknesses, the six flagship initiatives put forward on 6th February aim to recommit the Union in the region for the "perspective of a credible enlargement". These initiatives that were decided upon by the leaders of Europe at the Sofia Summit of 17th May 2018 were integrated into the "Sofia Priority Action Programme" presented in annex to the "Sofia Declaration", which was agreed by the Council on 26th June. The first initiative aims to "strengthen support to the rule of Law" by extending detailed action plans to all countries regarding chapters 23 and 24, by improving the assessment of the reforms, by guaranteeing follow-up to major processes and by linking overall negotiation pace to progress on these chapters. This is in line with the "new approach" adopted by the Council in December 2011. Moreover, support will be provided to the independence and plurality of the media. On 26th June the Council fully subscribed to this approach. The Commission also intends to link financial assistance to fundamental reform. In effect, this does not mean that there will be fewer laws to adopt (since the legislative framework will mostly be in place, with the technical and financial support of the Union) but rather more their efficient and effective implementation in the field. This is also a vital condition for investments as stressed by the President of the EBRD, Suma Chakrabarti at the Balkans Summit in London in February 2018. Because it will be the real progress made by these countries that will be judged. The second initiative aims to "strengthen dialogue regarding security and migration", which implies a great deal of cooperation to counter terrorism, organised crime, arms trafficking and for the management of the borders. To the political and economic chapters, which are linked to the membership criteria, the Union has added a "good neighbourly and regional cooperation" chapter to the Stabilisation and Association Process (SAP) adopted in 1999 by the European Council and approved with the Western Balkans at the Thessaloniki Summit of 21st June 2003. Regional cooperation has moved forward albeit weakly from an economic point of view. However, reconciliation is still a long way off, even though the leaders of the Balkans committed in this sense at the Vienna Summit on 27th August 2015. The wounds of the Second World War and the wars of the 1990's are still too often re-opened via the rehabilitation of war criminals, the denial of crimes or ultra-nationalist invective. Ethnic rhetoric - whether it involves the past or whether it inflames the fear of the future - is too often used to justify staying in office or deflecting attention in the face of the difficulties experienced by the latter. Croatia, a new Member State, also practices provocation of this kind and often holds Serbia to hostage in membership negotiations. Both of their presidents gave themselves two years in February 2018 to settle their border dispute. But in the knowledge that Croatia has declared that it does not want to respect the decision of the Court of Arbitration of 29th June 2017 in a similar dispute with Slovenia, we might be justified in showing our reserve as to this commitment. The Commission has therefore been very clear about this: "The Union will not import any bilateral disputes." They must be settled, if need be by international arbitration, whose decisions will be "implemented and respected before accession and they will be included in the treaties." Moreover, it intends to link financial aid with good neighborliness, a powerful lever to guarantee the respect of the agreements concluded. The lessons of Cyprus and the Croatian-Slovenian dispute have been learnt! The Council echoes this: "the legacies of the past must be overcome, and reconciliation promoted, notably via a climate of tolerance." And the European Council stressed the exemplary nature of the agreements concluded by Macedonia with Bulgaria and Greece for the entire region. This firm stance is all the more necessary since dialogue between Kosovo and Serbia is stagnating. Very few agreements concluded since 2011 have been totally implemented, thereby depriving citizens of expected progress and discrediting the process, as well as its facilitator, the Union. Given its political deliquescence, the upkeep of the visa regime by the Union and the economic crisis, Pristina has attacked the Union and its five Member States that have not acknowledged it. The advisor for dialogue working for Prime Minister Haradinaj, Avni Arifi has just accused the Union of "serving Serb interests and of ignoring Kosovo's requests." Whilst the majority and the opposition fight over the responsibility for dialogue and the president continues to represent his country without a mandate! 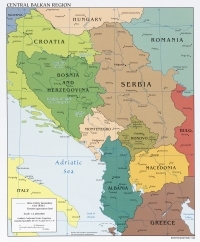 Which holds Serbia to ransom, the successful dialogue with whom is a key condition in its membership negotiations. For its part Belgrade is slowing the implementation of several agreements arguing that the creation of the Association of Serb majority town councils, an emblematic institution for the latter, has been held up by Pristina for the last three years. And it has also been undertaking an active campaign to limit Kosovo's participation in international organisations and events, whether these are sports or cultural venues. The spirit of dialogue is far from being a reality! If there is no resolute commitment and permanent follow-up on the part of the Union, dialogue will not really move forward, and regional stability will be weakened by this. The Council of 26th June demanded both sides implement immediately the agreements that they had concluded. The backing of the leaders of Europe in Sofia to the 6th initiative in "support of reconciliation and good neighborly relations" is therefore very welcome. It will notably become effective with the support of transitional justice (the fight to counter impunity) and by the strengthening of links between civil societies. In its February communication the Commission also drew a harsh picture of the economic landscape: the Western Balkans are still not viable, competitive market economies. In other words, this means that the criteria adopted in 1993 in Copenhagen in view of the 5th enlargement are far from being fulfilled. Hence the Commission is calling for in-depth structural reforms, which the economic convergence programme will support via the three other initiatives. 'Supporting socio-economic development and placing particular emphasis on young people' this is the goal of the 3rd initiative approved in Sofia: improving the investment framework and guarantees, increased support to education and doubling the Erasmus+ programme, an extended field of action by the Regional Youth Cooperation Office (RYCO, approved at the Paris Summit on 4th July 2016), progress in the implementation of the regional economic space approved at the Trieste Summit on 12th July 2017. 'Increasing connectivity, the fourth initiative, fits perfectly with the aim of the first conference of the Berlin Process in 2014, which focused firstly on the connectivity of the networks. It notably provides for the launch of new transport projects (including the "Nis-Pristina peace motorway"), the implementation of the Treaty establishing the Community of Transport, support to a railway strategy, gas interconnection between Bulgaria and Serbia, the enlargement of the Energy Union to the Western Balkans and the completion of the regional electricity market. Finally the fifth initiative aims to "launch a digital strategy", notably via the reduction in roaming tariffs. To do this increased financial means are required. In its communication on 2nd May 2018 regarding the Multi-annual Financial Framework 2021-2027, the Commission suggested bringing pre-membership aid up to 14.5 billion € against 12 during the period 2014-2020. In the knowledge that this total includes Turkey, some of whose funds will be frozen, it is a significant financial package which will benefit the Balkans. In February it also introduced the idea of a linear progression in financing until membership, and even after this, rather than a significant and sudden increase in structural funds that cannot always be absorbed. This is a wise initiative, which is finally being introduced after being discussed for many years. The truthful language employed in the Union's strategy and pragmatic re-commitment around these 6 initiatives were unanimously lauded by the European Parliament, the Member States, the press and especially civil society. In Srdjan Majstorovic's opinion, it is a "positive message to the citizens, investors and politicians". In the same way of course as the "unequivocal support to the European perspective" of these six countries, confirmed in the Sofia Declaration and by the Council of 26th June. By contrast, the reference to a possible accession by Serbia and Montenegro in 2025 was the source of incomprehension and opposition. Unlike Turkey the European anchorage of the Balkans is unquestionable. It is an enclave, a "region embedded in the present Union," to use the words of President Macron, which the "Balkan route" tragically illustrated. "Our historical, cultural and geographical links and the interests we share in the political and economic area and in terms of security" make these countries naturally eligible to article 49 of the Treaty, a position that has been unanimously adopted by the Union and all of the Member States since 1999. The bids to destabilise and external pressure of which they have been the focus incidentally, remind us of the "historic game" played by the major powers, which make this region fragile, whilst its security is vital to the Union. This situation was summarised by Jean-Claude Juncker at the European Parliament on 17th April: "if we do not open up a European perspective in this complicated, tragic region, war will break out there again as in the 1990s". As for Russia, it is not membership of the EU that it opposes - which it is anticipating by investing in the candidate countries - but the enlargement of NATO, as Foreign Minister Sergei Lavrov has just recalled. The President of the Council of the Federation of Russia, Valentina Matvijenko, was even more direct: "We are against Bosnia-Herzegovina and Macedonia joining NATO." The discourse delivered by President Erdogan is more dangerous, as Turkey increases in investments and its religious influence in the region: "I address my greetings to all of the victims and oppressed brothers in Sarajevo, Skopje (...) and Mostar. These towns lie in other countries, but they are within our spiritual borders,". Hosted in Sarajevo on 20th May 2018 as the "Sultan of its former territories," Recep Tayyip Erdogan has won back the credibility of the SDA, a party of the co-president Izetbegovic, thereby contributing a little more to the division of Bosnia-Herzegovina. Although their "European perspective" is not under threat, the conditions to integrate the Union are the focus of debate for four main reasons linked to their domestic situation and their history. Firstly, the rule of law and all of the ills pointed to by the Commission and the Council, as well as the slowness of the transformation of commitments into acts, of the implementation of laws, is causing a problem. Some European leaders crudely stated the reality of this to their counterparts in Sofia in sometimes heated debate - to the point that President Vucic spoke of it as a "battle of words". Prime Minister Rama spoke of a "special thing in our genes linked to organised crime that we have to deal with.". The humor to which he is accustomed betrayed sharp criticism heard on the part of his counterparts. Then there is the fear of "illiberal" contagion, whilst political practice resembles this in many ways. "Illiberalism", which is not rejected by the Serb Orthodox Church, if we are to believe Patriarch Irinej: "Our politicians are sacrificing everything to the coloniser, accepting the Euro-American civilisation, which is worse than communism.". It is also revealing that Prime Minister Orban regretted that a firm date for Serbia and Montenegro's accession had not yet been put forward! The third reason, beyond the legacy of a painful past, lies in the reluctance to commit to consensuses, deemed as a sign of weakness by nature, and which thereby deprive the leaders of their nationalist card. This handicap weighs heavily on the political climate, on the reform process and on the settlement of bilateral disputes. This is why the Macedonian agreements with Bulgaria and Greece are so exemplary. Lastly the feeble level of economic development and the degree of investments necessary lead to fear of slow catch-up, especially since the six countries are suffering a dramatic decline in their populations and an exodus of young people to the Member States of the Union. Reactions to "by 2025" were therefore on a level with the surprise that this date caused, both in the European Parliament and in a major share of the Member States: "not a credible date, strict conditionality first, do not speed up the process". The German government was clear: "automatic membership at pre-set dates is out of the question," whilst Manfred Weber, President of the EPP group declared: "the criteria dictate the timetable and not the opposite." The press was even harsher: "political negligence" for Die Welt, a naïve Commission that is "blind to the problems," for Bild. Several media also stressed the contradiction between this date and the present situation, as expressed by the President of the European Movement of Montenegro, Momcilo Radulovic: "Never has the Commission been as clear regarding the links between government and organised crime, but it has created confusion by speaking of possible membership in 2025." "2025 is not a date, but a simple perspective," insisted Vice-President Timmermans and Commissioner Hahn as they tried to defuse the debate. Indeed, the strategy is extremely prudent: "With strong political will, the introduction of real, resolute reform and the settlement of disputes with their neighbours, Serbia and Montenegro, "might possibly be ready to join by 2025." It is impossible to be any more careful than that! Especially since "real reforms" would imply a sufficiently long period to ensure their transformation into fact and in the field, a period between "ready to join" and their effective membership, for example? This is the crux of the matter, notably in light of the memberships of Bulgaria and Romania. Because what is not done before membership is much more difficult to achieve afterwards. If conditionality is strictly respected, then fears should be minimal and 2025 will remain a fiction. If, however some Balkan countries were to experience a period of instability that threatened the Union's security, there would be great danger of a sudden rush towards early membership, like Greece's hasty accession to the Union. They would become dependent on their "European cash" whilst they had not even have respected the criteria and might have even denigrated the principles and values of it, like Hungary and Poland. It will therefore be vital for the Union not just content itself with what Florian Bieber calls "stabilocracy", i.e. the acceptance of authoritarian regimes in exchange for stability. "Our interest, like our responsibility, which will help us build true European sovereignty from the geostrategic point of view, means anchoring the Western Balkans firmly in the European Union, to do it forcefully and with strategic clarity. This cannot be done at the expense of unity and coherence (...) therefore, 'yes' to supporting them, but according to clear conditions (...). If we want a stronger, more united European Union, we have to modernize it." This declaration by President Macron during the press conference in Sofia summarises the parameters of the debate initiated in the Commission's communications at the Council on June 26th. Again, the two issues, which have haunted membership negotiations since those with Greece, and especially those of the 5th enlargement, have been at the centre of discussions. The first relates to the point of optimum equilibrium between progress achieved, allowing the passage onto the next stage and the inadequacy of progress, justifying the upkeep of conditionality until the next stage - with its corollaries: are we in danger of allowing people to believe the process will be "easy" or on the contrary, will this lead to a virtuous circle of reform, since it will be rewarded by progress on to the next stage? - or is there a danger of discouraging and leading people to believe that more political considerations lie behind the criteria and conditions? This raises the perennial question of "the carrot and the stick", the response to which has not always been a very happy one in the past. This is this question that the Member States had to answer at the Council for the opening or not of membership negotiations with Albania. A great majority asserted that the difficulty, risky reform of the judicial system - set as a condition in 2014 - was firmly on course, that Prime Minister Rama promised to entertain good neighborly relations, notably with Serbia and that making a gesture would gain the trust of the Albanian minorities in the Balkans. "We have seen progress but not enough. We want to see results" explained the Dutch Minister, Stef Blok. Denmark, France and the Netherlands indeed deemed that additional work had to be undertaken in terms of judicial reform, the fight to counter corruption and in the dismantling of criminal networks. And the Council finally followed them, planning the opening of membership negotiations in June 2019, on reserve that reforms continue. It is a positive conclusion for Albania, welcomed as such by its Prime Minister. It was different for Macedonia with whom the very same question arose with the Council according to the following terms. Since Greece's veto was impeding the launch of negotiations, proposed since 2005, the courageous settlement of the dispute over the name should have therefore been rewarded with a positive decision, especially since this will help towards regional stability. The very credibility of the Union is in the balance here, whilst postponement of the decision might compromise the ratification of the agreement. Finally, although it is true that certain reforms were abandoned during the Gruevski period, the new government has launched a credible programme to catch-up. France and to a lesser degree, the Netherlands insisted on having proof of the real results of these reforms before moving on to the next stage. And the Council, at the end of a difficult debate, was forced to accept, since unanimity is the rule in terms of enlargement. The agreement was however welcomed and supported in a special comment in the conclusions of the European Council on 28th and 29th June. As with Albania negotiations are due to start therefore in June 2019 on reserve of reform of the judiciary, work to counter corruption and organised crime, as well as the reform of the security services. If this is the case, then the first intergovernmental membership conference would take place for both countries before the end of 2019. And the Commission can launch the preparation of negotiations, i.e. organise the analytical assessment of the community acquis. Although the postponement of the opening of negotiations with Albania is understandable, that with Macedonia is a hard decision that ignores the true revolution achieved by Skopje that is so rare in the Balkans. It is a pity that the call by Prime Minister Zaev for a "motivated decision by the Union, which is the driving force in the Balkans" and that of Germany, amongst others, were not heard. But the postponement of this opening until after the European elections will not fool forces that are hostile to this membership, should this be the real reason. The second question which is raised during enlargements is linked to the prior reform of the Union. The position of President Macron on this issue is shared by many Member States. And many voices have been raised in this direction in the European Parliament. This is what the Commission suggested in part III of its Communication on 6th February 2018: "Preparing the Union to take in new members" which is included in its global programme to enhance the Union by 2025. Apart from the financial means to be found, institutional questions are extremely important and firstly "it is important for the Union to be stronger and sounder before it can grow bigger (...) via an extension of a qualified majority vote,", on which the Commission will publish a communication at the end of 2018. It is true that the disruptive effect that the increase in number of States - and "small" ones at that - might cause is to be feared. Indeed, being so happy to have reached their goal, i.e. membership, they might be reluctant to continue European integration, and they might even adopt positions that would challenge already difficult internal cohesion and solidarity. Then, since "becoming a member of the Union means accepting and promoting its values" the Commission has just suggested "a more effective mechanism to overcome systemic threats or breaches of these values," with a link to budgetary financing. This is a major, but vital innovation that is already being contested by some. Other "institutional arrangements" are due to be drawn up. All of these reforms would be integrated into the membership treaties. The reform of the Union and the opening of membership negotiations are not exclusive processes in the knowledge that the latter will only be completed in the long term - on condition that the Union remains determined to implement rigorously the conditionality that it has set. France would have to ensure this during negotiations, in close cooperation with many Member States who share the same ideas. It is true that "this reluctance to enlargement has become a dominant and almost neurotic trend in France, to the point of being in contradiction with our strategic interests.". Indeed, France is the Member State in which the perception of the previous enlargements is the most negative. Beyond the salutary concern of defending the Union's internal cohesion and its functioning with additional members, the vital question of public opinion is raised here. The Commission, the judge and party in the process, is expecting the Member States to explain and justify. In effect, who better than those who decide to do it? The Council stressed this on 26th June. Communication will obviously have to focus on the reasons and merits of these memberships. The word "membership" also reflects a nation's wish and its free will to share parts of its sovereignty, in order to manage them better with others, rather than "enlargement" which seems to reflect a decision by the centre to absorb its periphery. Acceptance on the part of public opinion will depend on five factors. Firstly, it will depend on the Union's ability to master and manage migratory flows, monetary stability and the negative effects of globalisation, including the trade war started by the USA. Then there is the question of Turkey. Indeed, those who speak of "enlargement" think of Turkey and answer "no". Undoubtedly it might be easier for public opinion to accept the membership of the Balkans if a "privileged partnership" with Turkey replaced its project to integrate the Union. Moreover, it will depend on the vital transparency of the negotiation process in terms of access by organisations of civil society and the media to documents and their contribution to essential debate. The Member States will therefore have to accept the publication of the negotiation documents. It will also depend on the guarantee that these memberships will not create more economic problems that some attribute to the most recent accessions. The dangers are evidently less due to the size of these countries and their economies: the six countries only total 18 million inhabitants and their global economic weight is only 85 billion €. Moreover, their demographic decline should not place any pressure on the labour market. In all likelihood the membership negotiations should include prudent transitional periods in areas in which previous memberships offer us useful lessons, which the Commission should include in the sectoral impact studies that it has proposed to undertake when the relative chapters are addressed. Finally, there is the issue of the borders. An answer has never been given to this, since it is not in the nature of the European project to limit its geographic range. And yet in these troubled times in which the Union must show its added value and reassure its citizens, it has to define its limits. As Thierry Chopin say: "if we do not take into account the reality of the Union or initiate debate that will lead to the political declaration of the Union's limits - even on a temporary basis - there will be a risk of extending a latent malaise regarding Europe, which will prevent France from playing its role to the full ." This is especially the case since the countries in the Eastern Partnership, with the support of certain Member States, are pressuring the Union to recognise their "European perspective" as well. Although ambiguity is sometimes constructive, it can also increase frustration and cause disillusion, as with Ukraine. Speaking the truth seems necessary: including the Balkans long term in the Union for geostrategic and security reasons, but indicating to the countries in the Eastern Partnership that it will be limited to privileged agreements that have already been signed. When the time comes the best pre-membership period will not eradicate fears. The need to ensure that an entity as vast and as differentiated as the enlarged Union will retain its cohesion and function effectively, whilst taking on board the complexity and history of these future members, should lead to open thought, especially since the perspective of some members' accession is on the distant horizon. The Council also recalled that accession will occur according to merit and not by groups of country. Michael Emerson has just suggested the creation of an extended European Economic Area, including the Balkans. Although this option would make sense for countries for whom membership is too far away, it is difficult to see however how the Union might go back on the promise it made 20 years ago, which has never been challenged by any Member State. Especially since the membership of Serbia and Albania in the Union (after that of Croatia) is the condition for regional stability, even though the other States might remain in the background for a long time to come. Another option would be to introduce flexibility in time, without challenging the very principle of membership. It might be done in three stages. During the first, reform would continue and the Sofia Programme be implemented; close, transparent monitoring of effective reforms (track record) would be ensured, with the full participation of organisations from civil society; the link between fundamental reform and pre-membership aid would be effectively applied. In a second stage when a State has fully fulfilled the conditions to take part in the Single Market and adjacent policies (such as transport and energy) a membership treaty would be prepared. It would then trigger an increase in budgetary aid funds, full participation in the "General Affairs" Councils, as well as in the "Foreign Affairs" Councils as observers, except during points on the "Western Balkans". But the treaty would contain clauses which would only be completed after the third stage, a "probationary membership period" to ensure the full respect of the commitments made in the field. On the unanimity of the Member States the treaty would then be signed, thereby opening the way to full rights as a new Member State. If we accept that their membership is an "investment for peace, security and the stability of Europe", then this admittedly, somewhat unorthodox approach, would have the merit of taking into account the state of the Union and of its public opinion, and also the state of the Western Balkans. In all likelihood, the success of their membership will lie firstly in the hands of their leaders: "leading through exemplarity; explaining the reforms and doing them; settling bilateral disputes and promoting reconciliation; guaranteeing the free press and full participation on the part of civil society." The ideas expressed here are those of the author only. Albania, Bosnia-Herzegovina, Kosovo, Macedonia, Montenegro, Serbia. Commission Communication: "A credible enlargement perspective for and enhanced EU engagement with the Western Balkans"
COM (2018) 65 final, 6th February 2018. SWD (2018) 150 to 156 final 17th April 2018. These country reports are annexed to a short communication on 'The EU's enlargement policy' - COM (2018) 450 final. Pierre Mirel, "The Western Balkans between Stabilisation and Integration into the European Union" Robert Schuman Foundation, European Issue n°459, 22nd January 2018. According to Stevo Musk and Srdjan Cvijic, Politico 22nd April 2018. This recommendation was made by the Commission in 2005 for the first time but has been blocked since by Greece precisely due to the name of Macedonia; Greece is against the name "Republic of Macedonia" that was adopted on its independence. It was accepted by the UN and the EU under its temporary name: Former Yugoslav Republic of Macedonia until the settlement of the dispute. Published in Koha Ditore, 18th February 2018. Interview on Radio Free Europe, 8th February 2018. Established to date only by the countries negotiating membership for the chapters 23 (Judiciary and fundamental rights) and 24 (Justice, Freedom and Security), whose precision and concrete nature are precious guides for reform and the assessment of these. Montenegro and Serbia have put these action plans in English on their site. As part of the Berlin Process launched by Chancellor Merkel in August 2014. This process was followed by the Vienna Summit in 2015, Paris in 2016, Trieste in 2017 and London in July 2018. "Stable institutions guaranteeing democracy, rule of law, human rights, the respect of minorities and their protection, a viable market economy as well as the ability to rise to competitive pressure and market forces within the Union." Except for Hungary which regretted the wish to enhance the monitoring of reform of the rule of law. President of the European Policy Centre of Belgrade (EPC). Interview on Beta News, 18th February 2018, on the eve of a visit to Belgrade. During a visit to Bosnia, 25th April 2018. Speech to the AKP in Sakarya, 11th March 2018. Balkan Insight, 22nd May 2018. Interview in Politico, 16th May. A statement that the Patriarch is said to have made during the Synod in May 2018, reported by Blic 21st May 2018. Pierre Mirel : "La Grèce et l'Union : d'une adhésion hâtive à la rente européenne", Diplomatie n° 88, September 2017. Also called screening, which comprises an explanation of European legislation and collating information from the candidate country on the way it has transposed the latter and on how it intends to adopt it to the full including which transitional periods that it might request. Draft regulation on "the protection of the Union's budget in the event of generalised breaches of the rule of law in the Member States". COM (2018) 324 final, 2nd May 2018. Yves Bertoncini, President of the European Movement-France, Le Huffpost, 17th May2018. See Pierre Mirel: "European Union-Turkey: from an illusory membership to a "Privileged Partnership" European Issues n° 437, 12th June 2017. Except for confidential trade data in come chapters, which is extremely limited. I.e. the equivalent of the GNP of Slovakia and an eighth of the Netherlands for a similar sized population. Thierry Chopin, "Emmanuel Macron, France and Europe. The return of France to Europe: on which terms?" European Issues n°473, 14th May 201; and "Which borders for the European Union? Europe's Varying Space", in the Schuman Report on Europe. The State of the Union 2018, Editions Marie B - collection Lignes de repères, 2018. With the countries of the EEA Turkey and those which have signed a fully Comprehensive Association/Free Trade Agreement. "The strategic potential of the Emerging Wider European Economic Area". CEPS n°2018/05, February 2018. Federica Mogherini at the European Parliament 17th April 2018. Srdjan Mastorovic, conference, European Policy Center, Brussels 3rd May 2018.